I don't have any training words of wisdom to offer, but I have been thru an extensive equine facility design and construction project, and I learned so much over the years of planning and building. I have learned that in every project, the most important splurge should be your floors. Your horses' legs are everything (and so are yours), and this is the most difficult and disruptive thing to upgrade later. We used the thick rubber tiles (dog bones, as our builder refers to them)for our aisle and grooming/washing areas, and they have been a dream! 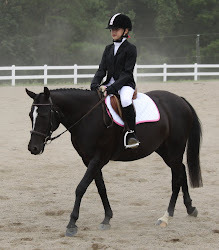 The floors are so comfortable for your legs, do not get slippery, are super quiet (can even take the pawing out of anxious horses when they don't get a good loud sound out of it), and look amazing. One thing that was actually a bit of a redesign when we were in the process was our drain system. We poured concrete floors to set the tiles on, but we added three large (18" x 24", I think) drains at even intervals down the aisle. We also put a drain in the center of each wash area. Initially the drains were elevated so that the tile flooring bumped up next to them, but even my non-horsey husband looked at this and said there wasn't a horse in the barn that would go near those beastly drains. The fix was to cut the legs off the drains so that they set into the concrete flush and lay the rubber tiles over the top of them. We drilled holes in the tiles first to let the water thru, which was fine in the aisles but clogged up in a minute in the grooming areas. Then we cut a pattern in the tiles (I'll take a picture) to make bigger openings to the drains, and the result has been fantastic. The floor is a continuous and safe surface with nothing to trip over or hang up on, and everyone's legs are very happy! 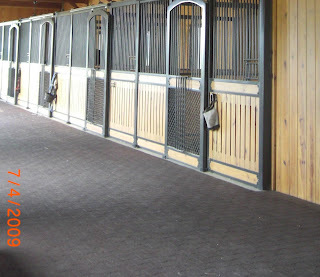 So, if you're renovating your barn or building a new one, and you are going to splurge on one thing, my hands down vote over everything else we did is the floor. You can add a lot of other things later, but this has an immediate impact on your horses' sound legs and is a beautiful, soft look as well.